Jearl is a Redguard who owns a house in Bruma. She has been ordered by Ruma Camoran to spy on the Cloud Ruler Temple with her friend Saveri Faram for an attack on Bruma. She is a Mythic Dawn agent and you will have to root her and her companion out during the Spies mission on the Main Quest. She only appears in the game once the quest is initiated and like all the other agents at this point, will attack you on sight. As she's very busy during the night, Jearl sleeps late and gets out of bed no earlier than 12pm. She spends the next two hours inside the house, talking with her partner-in-crime Saveri, until sitting down at the dinner table to take her lunch at 2pm. At 4pm, she exits the house, crosses through Bruma and heads for the Hestra Rune Stone southeast of the temple. She arrives around 5pm and then waits her for partner to show up. When Saveri appears around 8pm, if the player is nearby and undetected, Jearl will start sneaking and will move up the road and find a good stakeout spot closer to the Temple. She will observe the Temple from there until 10pm, where she sneaks back to the Rune Stone. If Saveri is dead, Jearl will just stay near the rune stone, regardless of the player's presence. At midnight, she finally leaves and heads for their hideout in the depths of Bruma Caverns, next to the underground entrance to her basement. She arrives at around 1am and will stay down there until bedtime at 6am. Jearl wears a pair of buckled shoes, a flax tunic, and sack cloth pants. She carries around her house key, the key to the basement, and a small amount of gold. The moment she sees you, she will shout out; "You cannot escape the Master's vigilance!" and attack you. The only spell that Jearl uses is the standard Mythic Dawn Mace and Armor spell; she has no personalized abilities or powers. The first time you hear about spies in Bruma is when Jauffre tells you: "The gate guards have reported seeing strangers on the road for the past several nights. I cannot leave Cloud Ruler undefended while my men search the whole mountainside, but these spies must be eliminated." He will then point you towards either Captain Burd or Captain Steffan for further information and will end the briefing with a direct order: "Track down the spies and kill them. Find out what they know, and what they're plannning [sic], if possible." Steffan will point you directly to the runestone southeast of the temple for an easy solution: "We always see them near the runestone at dusk. They aren't too woodcrafty, but Grandmaster Jauffre has forbidden us to range too far from the walls. But it seems that you have been given the freedom to attack the enemy that we all crave! Good luck. We will keep the Emperor safe here, don't worry." Talking to Burd will prolong the investigation and add the Jearl topic to Bruma citizens. Asking him about strangers will have him mention Jearl: "Except for Jearl coming back from a trip down south, things are pretty quiet. Not much travel right now with the Oblivion Crisis." After Burd's observations, Bruma citizens will be ready to respond. The two beggars, Fetid Jofnhild and Jorck the Outcast will, for a small fee, inform you: "Ah, it's coming back to me now. Yeah, seems I saw someone looking out the window at Jearl's house the other day. Someone I'd never seen before. When Jearl wasn't home. You see what I mean? Now, if you'll excuse me, all this talk has given me a powerful thirst. Thankee kindly." From his favorite chair, grumpy newcomer Regner will add: "She's just back from a trip south, they say. Haven't seen hide nor hair of her myself though. Stays indoors all day long, I guess." Also, Arnora Auria will have some unique info: "Not that it's anybody's business, but I have noticed voices coming from Jearl's house. But I've never seen anybody but Jearl go in or out. Strange." Lastly, Ongar the World-Weary will comment: "Well, since I like you ... I think there's somebody staying with Jearl. Never seen 'em, but I've heard her talking to someone, and I've seen somebody at the window when Jearl wasn't home. None of my business, but since you asked ..." When you confront Burd with this info, he will be quite surprised: "Really? That is odd. I know for certain that she returned alone. I don't like it. Since you're working with Cloud Ruler Temple, I'm going to authorize you to search Jearl's house. I'll pass the word to my men. We won't interfere." If you, however, encounter Jearl before speaking to Burd, he will be shocked and grant you the same permission: "God's blood! So she was the spy? It seems there's no one you can trust these days. Since you're working with Cloud Ruler Temple, I'm going to authorize you to search Jearl's house. I'll pass the word to my men. We won't interfere." According to two unused lines of dialogue, Jearl was supposed to be an innocent Bruma citizen up until the quest. 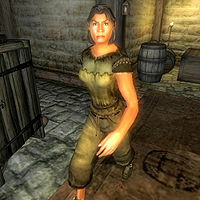 Both her introduction and description of Bruma were recorded but will never appear in the game: "I'm Jearl. I spend most of my time down south, but I keep a house in Bruma for the mountain air." and "I'm sorry, but I really don't know much about the town itself. I spend my time outdoors, walking the ridges and valleys." As Jearl and her partner have programmed schedules, it takes some time to travel from place to place. As a result, all the above arrival times are approximate. Jearl and Saveri share the same bed, which means that one of them has to wander around the house while the other one is sleeping.